Aladdin (top) and Jasmine (below) were adopted by David, Diane, Judith and Rebekah, who write, "They are both doing fine and love it here. Aladdin loves to sleep on our beds and he will follow you around if you have just petted him, he loves to be picked up and loves to cuddle with us. 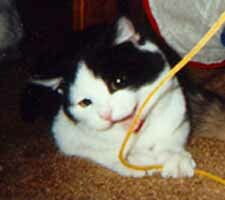 He will now come up for attention; he loves to play with Beatie, another one of our cats. He has a favorite perch in the kitchen, which he frequently shares with some of our older cats. When we come into the kitchen, he will reach out for attention and will roll around begging you to pet him or pick him up. He gets along really well with our dog which surprised us, considering when he came home and saw the dog he ran off and jumped up onto the valance in our dining room. We never thought they would became friends. They even play with each other. Aladdin has been a great addition to our cat family. "We probably should have adopted Jasmine with Aladdin. Jamsine is a really beautiful cat but it has taken her a longer time to adjust. She loves to curl up with us when we go to bed. She now rubs up to us when we feed our cats. Jasmine doesn't seek attention but she doesn't run away when you go to pet her. She even will let you pick her up and hold her. She now curls up with our other cats. (The picture to the left is with Sneakers.) Jasmine loves to eat with the other cats. She has one chair and couch she loves to lay on. Even though Jasmine is still shy, we believe Jamsine will come along as Aladdin did. They are both wonderful cats and we love Aladdin and Jasmine very much. " Hi, you kitty angels who rescued us! We got "caught" by this mommy-person you let adopt us. For over a year now we've let her think that we pretty much get along, at least don't hurt each other, and now she found out we actually like each other, are sometimes even nice to each other!! She bought us two perches (different heights since Ari had a hard time with the tall one with his vision) for two different windows. And we always used them both, one each. But Ari just recently learned how to jump on the tall perch and we got caught at this!!! She, the mommy-person, keeps saying how happy she is we came to live with her. Well, let us tell you, her happiness is nothing compared to ours!! We have food, and beds, and toys, and window perches, and lots of petting sessions, and two woodstoves where she konstructs kontrolled konflagration kreating komfy kozy kitty korners for us! We have a three-season porch with lots of sun and fresh air in the summer and now these stoves. What more could a kitty ask for?! All we can say is you are angels!! As scared as we were when you rescued us, not knowing what was going to happen to us now, you found us a good life, a safe place, and a loving mommy-person. 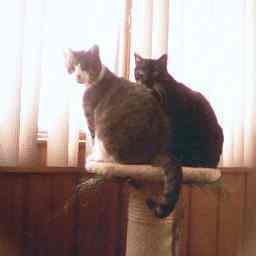 Bruno is Misty's third "Kitty Angel. ", adopted in December 2000. He was a four-month old bundle of energy when this picture was taken. 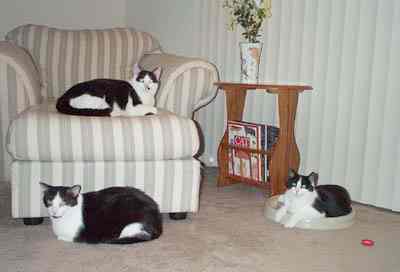 His surrogate sisters (Nikita and Sterling) took to him right away and they all have a blast playing together. We thank Kitty Angels so much for bringing us all together. 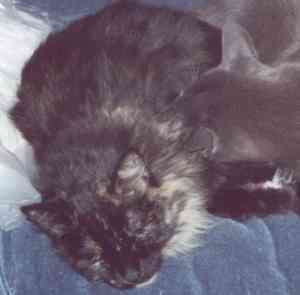 Jeebie, pictured here on the right, was adopted by Lisa and Josh in February 2001. 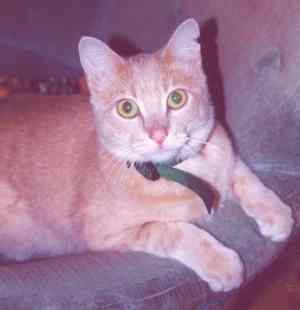 They write, "Jeebie loves his new home and gets along great with his new family of cats, as you can tell from the photo. It only took Jeebie a little more than a day to gain the confidence to explore his new home and "hang out" with the other cats. We're very proud of him!"